1. In small saucepan, combine chocolate chips and shortening; cook over low heat until melted, stirring frequently. 2. Line 8 muffin cups with paper baking cups. With pastry brush, coat sides and bottom of each cup thickly and evenly with chocolate. Refrigerate 10 minutes or until set. 3. Brush any thin spots with additional chocolate. Cover; refrigerate at least 2 hours or until firm. 4. Place water in small microwave-safe bowl; sprinkle gelatin over water. Let stand 5 minutes to soften. 5. Meanwhile, place 1 1/2 cups raspberries in blender container or food processor bowl with metal blade. Cover; blend until pureed. 6. Microwave gelatin on HIGH for 30 to 40 seconds or until gelatin is dissolved. Add to raspberry mixture; mix well. 7. In small bowl, beat whipping cream and sugar until stiff peaks form. DO NOT OVERBEAT. Gently fold in raspberry mixture. Cover; refrigerate until serving time. 8. Fifteen minutes before serving, carefully peel paper from chocolate cups. Spoon raspberry mixture into cups. Garnish with raspberries. Store in refrigerator. Ingredient Substitution Some supermarkets and gourmet shops sell chocolate dessert cups. They can be substituted for the homemade ones. Kitchen Tip If you don’t have a pastry brush, use the tip and the back of a spoon to spread the chocolate on the bottom and up the sides of the cups. 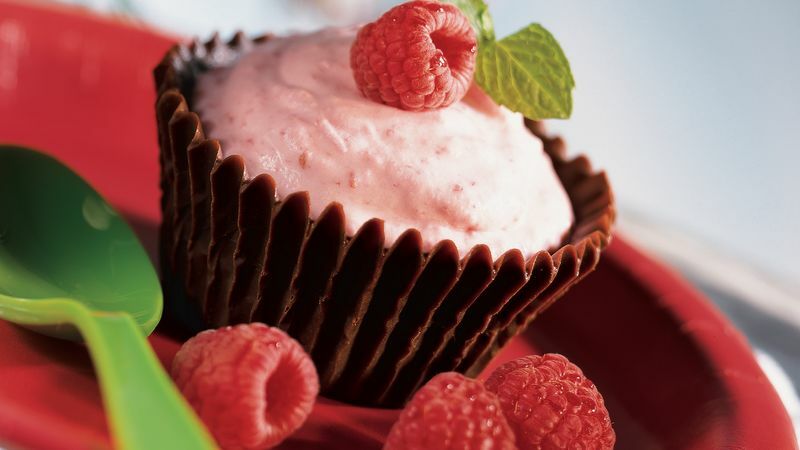 Recipe Variations Instead of preparing chocolate cups, purchase ready-made cups to hold the raspberry mousse. Try individual shortcakes sponge cake cups or tartlet shells. Fresh Raspberry Mousse with Whipped Cream is another simple variation of this recipe. Arrange fresh raspberries in small dessert dishes; spoon the mousse over the fruit. Garnish each serving with whipped cream and chocolate shavings.